A week ago Alain Demaret passed us a black/white version of the “Le Seigneur de Gonobutz” (“The Lord of Gonobutz”) album as prepublished in Le Soir. 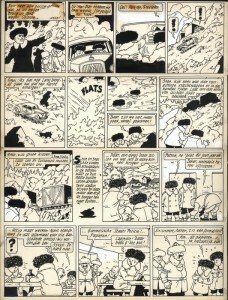 We presume this was in 1976 as there was also a prepublication of the story in Journal Tintin of 1976. This black and white publication had quite some hick-ups. Today we’ll discuss one already, namely 2 text balloons which remained empty, until 1983. 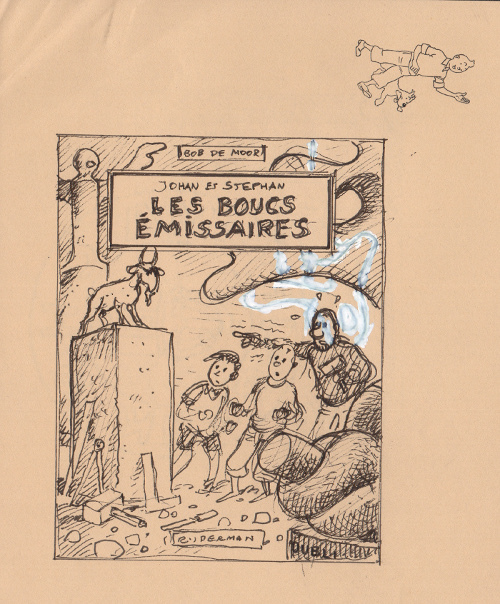 Page 26 of “Le Seigneur de Gonobutz” as published in Le Soir in 1976. 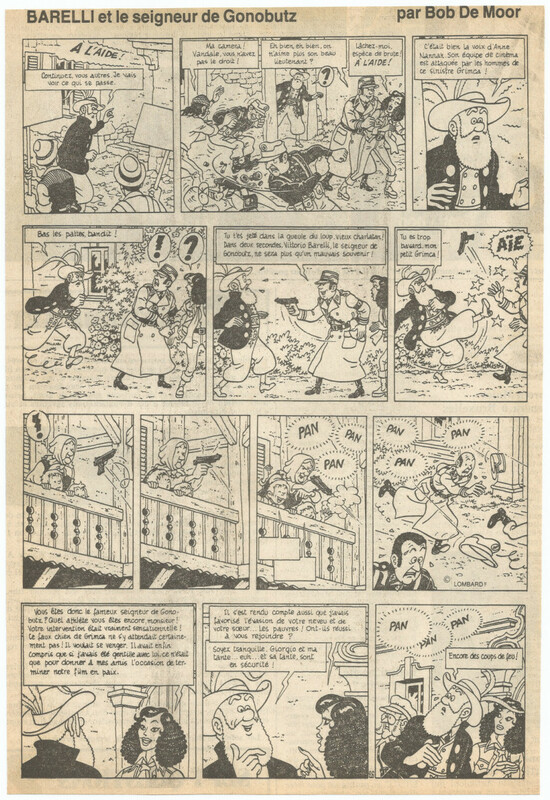 The page we discuss is page 26 of the Bob De Moor‘s “Le Seigneur de Gonobutz”, more precisely the 3rd frame of the 3rd strip on that page where you can see a grandma shooting at militaries whilst her two grandchildren are cheering. Cheering we said? In the Le Soir version there is no text in the text balloons. And there wasn’t one either in the Journal Tintin as far as we know (we don’t have that particular issue in our archives – if someone has that issue, don’t hesitate to let us know). The corrected text balloons in the Rombaldi version of 1983. The text from these text balloons is also missing in both the Rijperman and Bédéscope versions as published in 1980 and would only pop up in 1983 in the very correctly released Barelli compendium as published by Rombaldi. The text font however was different to the one used in the rest of the story. So for 7 years, nobody knew what those kids were exactly cheering. 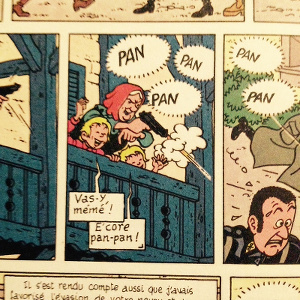 The missing lines are “Vas-y mémé!” and “E’core pan-pan!” which you could freely translate as “Go ahead grandma!” and “Shoot again!”. The “E’core” was used to stress that the kid is really young and doesn’t yet know how to speak well French in this case, because the correct word should be “Encore”. Note that the BD Must version as released in 2011 includes the correct text balloons. In later posts we’ll show you that there is more to this Le Soir version which is a bit odd to say the least. UPDATE: Pierre Gay worked on these particular pages. We added his comments. Between 1987 and 1994 Boogaloo, Casterman, Rijperman, and the Standaard Uitgeverij would re-release 8 Johan & Stefaan (Snoe & Snolleke) albums in color. 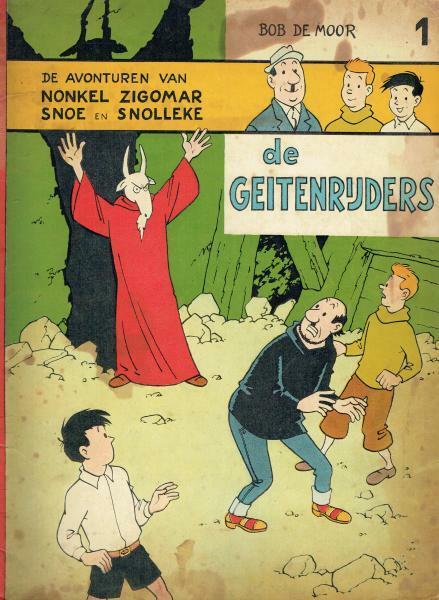 As we reported already a while back, this coloring included redrawing as well as you can see in this earlier article on “De Gele Spion”, some weird Dutch phrases and words plus brand new covers. Today we show you 2 more plates which were adapted by Bob De Moor for a release in color, again from the 1954 story “De Gele Spion”. The pages we show you today include the strips 117-120 and 125-128. 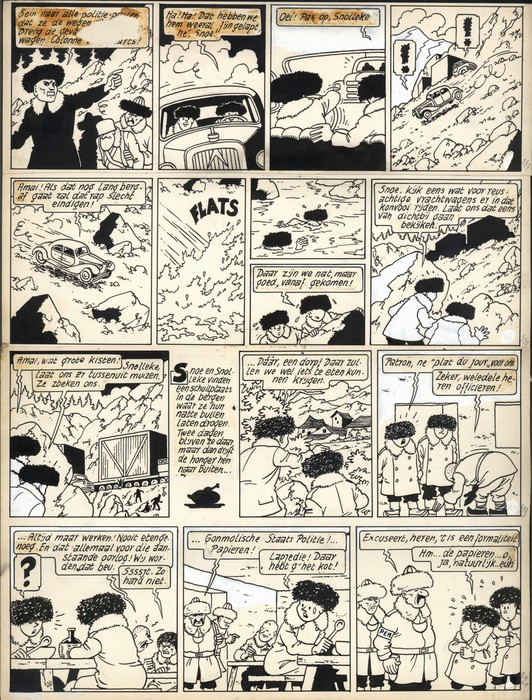 As you can see on the first 4 strips the whitening Bob De Moor‘s assistent Pierre Gay applied didn’t only serve to get rid of the black shadows and decors but also to detail people in the front which he originally added in total black (see the last case of strip 118 for instance or the first case of strip 119). He also removed the original strip numbering and wrote them again on in pencil on the border of the pages. As we remarked already, some collectors have restored similar pages in their original form, not all that difficult since the white paint is soluble in water. Note that the Dutch version of “De Gele Spion”, although announced for a 1988 release in color in Dutch via Casterman, was only released in French in color in 1987 via the Casterman distributed Boogaloo imprint. 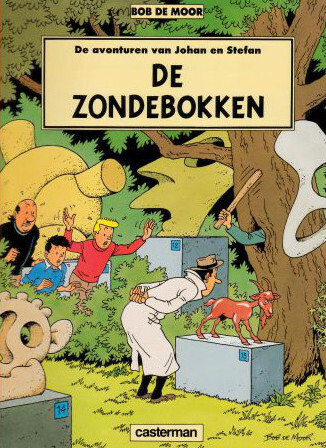 As a result Brabant Strip released it in 2004 in their Fenix Collection, the original black and white one in Dutch (à la Bob De Moor) that is with the black still intact. Another album, “De rode caballero” also never saw the day of light in color in Dutch, although prepared and announced by Casterman in 1989. 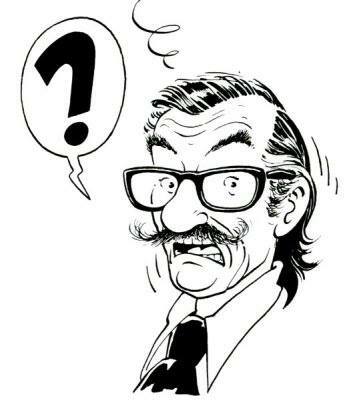 “De zwarte draak” was announced by Casterman but in the end released 4 years later via Standaard Uitgeverij.